Synopsis: Mark Wahlberg stars with Lou Diamond Philliips, Antonio Sabato Jr. and Bokeem Woodbine as a group of professional hitmen, whose lives get complicated when their latest hit goes bad. Moonlighting for some extra cash, they kidnap the daughter of a wealthy businessman-only to find out that she's also their boss's godchild! 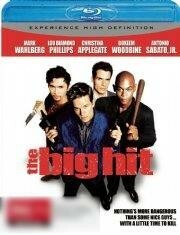 When Melvin (Wahlberg) is set up by one of his colleagues to take the rap, The Big Hit hits high gear, with the action and laughs flying thick and fast. For postage when ordering more than one item, select the correct postage option for the first purchase and then Combined for the rest. All orders will be posted the next working day after payment has cleared. All items must be paid within 3 working days of auction closing, unless otherwise arranged and intend to combine postage. CHECK OUT MY OTHER GREAT TITLES TO SAVE ON POSTAGE!